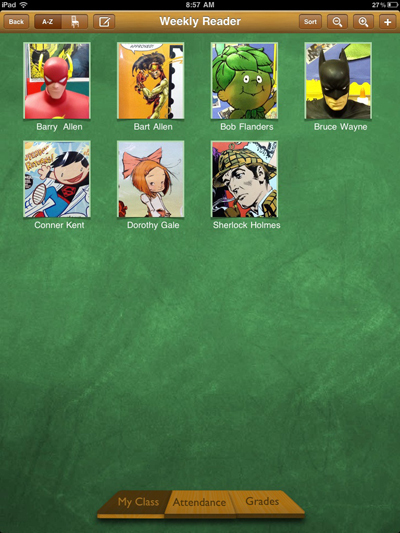 A wonderful app I have been using lately is TeacherPal. It is indeed a friend to me. I discovered this free app a while ago, but never got much of a chance to use it. 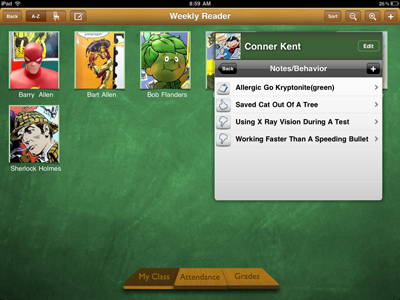 For the most part, it is a graphical classroom management app that allows you to make classes, take attendance, assign grades, and take notes on student behavior. Now, I did not intend to use this much. 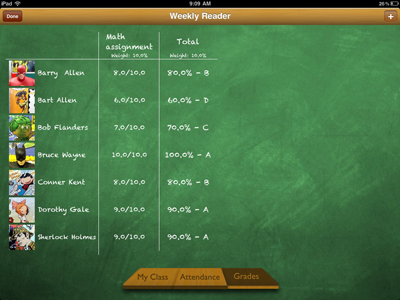 Like most schools, we already have a web-based attendance and grading suite made right here in Wisconsin, called Skyward. But being web-based it is tricky and often cumbersome to use on a tablet. TeacherPal just looks great. 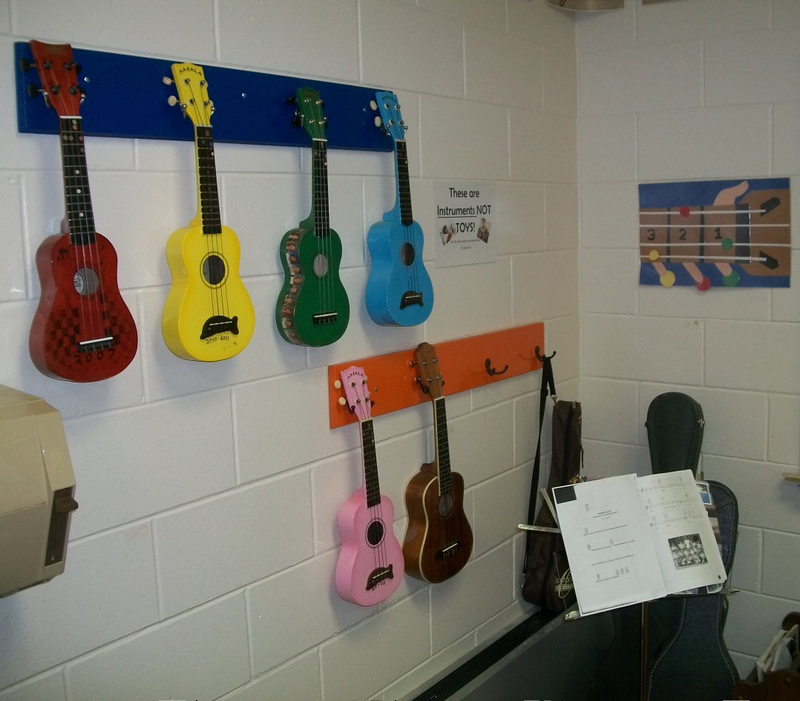 My classroom is organized by large thumbnail photos of my students. I tap one and it gives me all their attendance info, lets me take notes on their behavior or reading scores, see what their grades have been like, and even send an email to a parent. I still am going to use Skyward for grading and attendance because I have to, and because I am not going to do the same job twice. But TeacherPal has been great in letting me keep track of the dozens of behaviors and interventions that I previously had to put into a spiral notebook. My partner in the iPad trial, Scott, said it best when he mentioned how great it will look at conferences to click on a student and have all the important information right there, rather than a stack of papers in a manila envelope. If a hard copy is needed, say for permanent records? TeacherPal allows you to either upload your data to DropBox or emails you a handy Excel file, organized by student. For everything that this app does, the only thing that hampers it is the occasional crash and subsequent loss of data. Though in using it in the last two weeks, I have lost only a single note. To its credit, it did warn me that it had not been uploaded to the database and a restart fixed it. In education, where records are vital and can cost you your job, I hope it’s something they take care of soon in an update. If you are a teach and own an iPod or iPad, trust me and download this soon! I went into this school year skeptical about how I would use my new tablet. For one thing, I questioned how useful it would be when I already have a computer and a SmartBoard. However, I have noticed several changes in my behavior since using it. I am keeping better track of my student notes. I used to have a notebook where I would jot down late assignments, behavior issues and interventions. I find that with a handy App called Teacher Pal, I am keeping better records than before. Now when I click on a student’s name, I get his or her latest reading scores, a list of missing assignments, behavior issues, and positive interactions. Imagine how useful this would be in a conference, and how much better this looks than a stack of papers in a manila envelope. I am keeping better track of events. Using the calendar, I can set reminders for myself and never forget any of the little management issues that often trip me up during the day. Morning announcements? Rescheduled band practice? A student getting picked up early? I get little chimes throughout the day to remind me of the little things. They are like sticky notes, with alarm clocks strapped to them. I update my classroom blog a LOT more. Using the Blogspot app, it only takes me a few minutes to churn out an update, attach picture, and post it. I used to update my class blog every week or so. Now I get two or three posts a day, many of them written by my students. Many of the posts are little reminders for my class or updates for their parents. Hopefully this will go a long way toward making my classroom seem more approachable to parents, and the blog a place where my students can go to get updates. 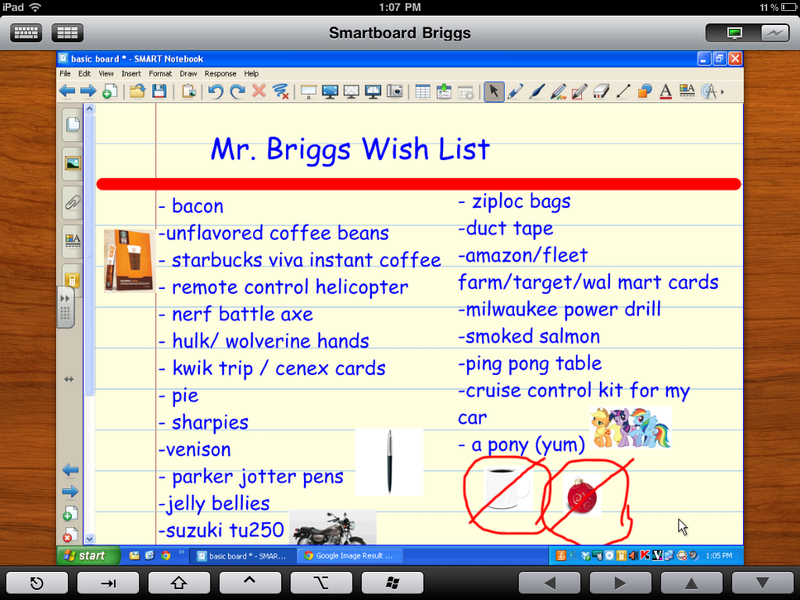 Be able to ‘write’ on my SmartBoard remotely, as though a miniature version of it were projected on my laptop. I have played around with a few programs, but most of them require a ‘double-tap’ or a ‘tap-and-hold’ to write. I want to be able to open an app, see the screen on my ipad and start doodling. Speaking of printing, I want to be able to print wirelessly to our network printers. ANY network printers, not the choice list of printers that made the AirPrint cut.